A GORGEOUS photo, Joe (like a giant crystal stalactite*), and you KNOW how I like “punny” titles! *Finally learned the difference. It’s “stalactite” because it sticks “tite” to the ceiling. Oh my! That is really something. Beautiful capture, Joe. Thank you Alys 🙂 More snow forecast for this tomorrow, welcome spring, LOL. Oh boy. You’ve had a tough winter, Joe. I will spare you the details of our (cough, cough) winter. It skipped us entirely. It’s snowing today Alys and we got about four inches yesterday ! Welcome spring, LOL. Oh boy. If only you could send some our way. Year four of the drought, ski resorts closing early or worse, losing there shirts. Ground water depleted. It’s all upside down, Joe. They do say water is the new gold and you guys really had it bad for the last couple of years. It is really upside down Alys. It is. Places in our state have actually run out of well water and will need to import. It boggles my mind. I’m also a Big Dripper but for tasting wine …!!! The Big Dripper? Joe? That’s the best you could do? Well, I suppose they can’t all be winners. At least the cold is not keeping you from taking new shots! So great! The crispness, the detail, the color! Love it! This looks as though it means business . . . great shot Joe! 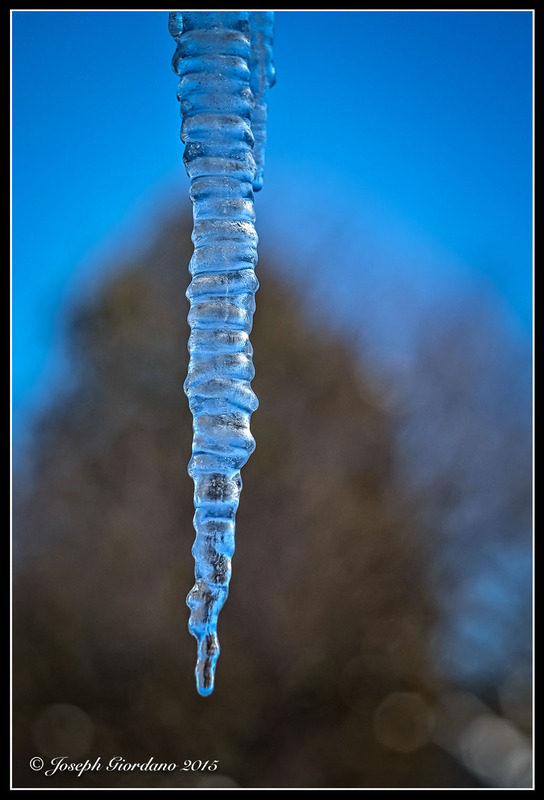 OMG – that looks EXACTLY like the icicle outside my kitchen window … before it melted. Me too Mary 🙂 Thank you. Stunning photo. I love the colours in the ice. joe, wonderful image, incredible colours…scrolling up and down, down and up!